A word that beckons images of adventure, conquest, and romance. Among the many natural blessings afforded Costa Rica, one of her most priceless and least visited areas is the lush Caribbean coast, an area of untold beauty and riches. As an example of a unique culture reflected in language, food and dance, this zone also offers world-class fishing, hiking, bird watching, horseback riding, all types of water activities including; ocean and river kayaking, surfing, diving, snorkeling, canoeing …. the list goes on and on. The port city of Limon is Caribbean flavor all the way. Capital of the Afro-Caribbean culture in Costa Rica, Limon possesses dialects based on the English that have survived thanks to the natural barriers between the Central Valley and the Caribbean Coast. About an hour south of Limon is Cahuita, another charming Caribbean town, which lends its name to Cahuita National Park. If Limon is the gateway to the Caribbean, Cahuita is the threshold to the Talamanca Coast, least known but richest part of this mystical region. Known for its marine wealth, Cahuita National Park's reefs hold one of the greatest varieties of live coral along its' white-sand seashore. More than 35 coral species, 128 seaweed species, 140 mollusc species, 44 crustacean, and 123 fish species have been identified. 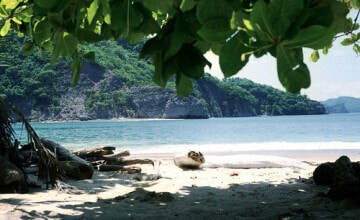 Cahuita is a magical fusion of emerald forests, turquoise waters, coral reefs, white sand beaches and friendly people. Half an hour south of Cahuita is Puerto Viejo, a top destination, the perfect place to kick back and relax for a few days or weeks with miles of gorgeous beaches running north and south from town. Manzanillo is literally the end of the road but the beginning of many great adventures. From here you can take a boat, horse, or set off on foot to Gandoca-Manzanillo Wildlife Refuge, one of the most scenic regions in Costa Rica and one rich in flora and fauna. Nearly four hundred species of birds have been identified in and around the refuge and the only mangrove estuary on Costa Rica’s Caribbean coast is here. Several endangered species such as the tapir and crocodile find protection in the park. A water sports garden as well, Manzanillo’s river kayaking is an excellent way to probe the interior. Hikes into the jungle to visit different Indian reservations give good insight into indigenous life. Other pursuits available for the adventurous nature lover include jaunts into primary forest areas like Hitoy-Cerere Biological Reserve, and wading far upriver into the interior where you’re as likely as not to see several varieties of poison arrow frogs, as well as dozens of different birds. Although the northern Caribbean coast (Tortuguero National Park, Top destination) has one of the heaviest rainfalls in the country, as much as five and a half meters per year, the rain is distributed more evenly throughout the year than in other areas making this a more pleasant, “evergreen” environment. The average 77-86 degree F. is moderated by the warm, shallow Caribbean water and refreshing tropical breezes. January and November are transitional months with higher winds and some rainy days. Mid-August through the first part of November is summer like weather with the least amount of rain.